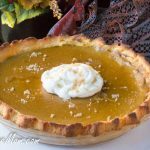 This Sugar Free Pumpkin Pie has a grain free, gluten free and nut free sweet crust with a creamy keto pumpkin pie custard filling all made sugar free and no one will notice the difference! 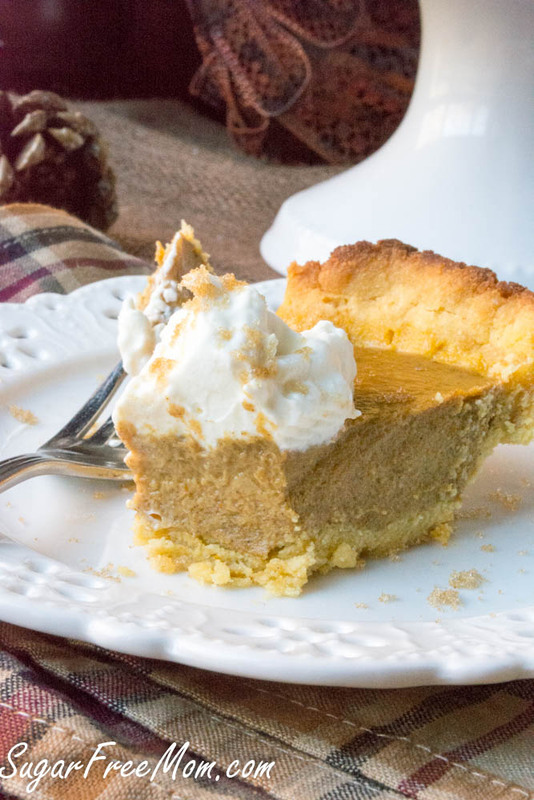 Traditional pumpkin pie made healthier with a grain free coconut flour pie crust and a sugar-free filling is everything as good as the classic and no guilt involved for indulging! 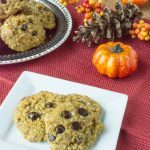 I’ve used this recipe for years since I first posted it in November of 2012! Back then I was still eating whole wheat so that version is staying on my blog. It can also be made crustless as a custard and that version is also staying on my blog. 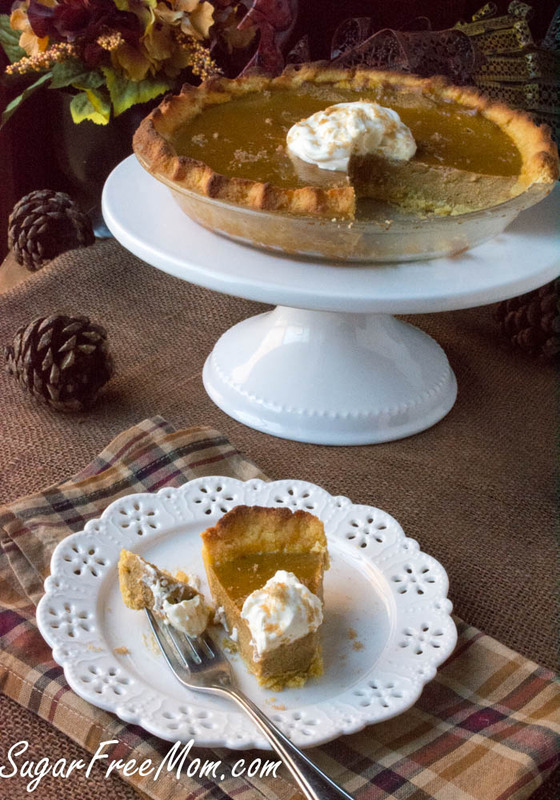 But what I really wanted to share with you this year is how fantastic this pie is in my coconut flour grain free pie crust! 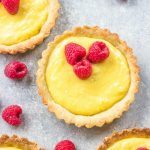 I knew this pie crust was a winner when I was not only able to make it for a savory quiche but also switch it up a bit and use it for a sweet pie. It’s perfectly flaky and works well every time! Even if you’re not a fan of coconut, I can promise you this crust does not have the flavor of coconut. 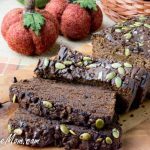 The pumpkin takes the spotlight here and this will be a much loved recipe you will continue to make year after year. 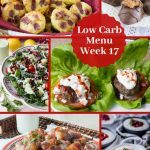 I do believe even your non low carb family members will love this pie! I recently brought this pie to a house warming party for a friend and it was gone quickly. SO many people were excited it was a gluten free/allergy friendly option. You just can never go wrong when it’s grain free because more often than not there is someone at a party who will be forever grateful for a piece. 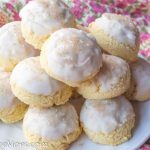 Top with some sugar-free whipped cream and this is over the top delicious! Comforting, satisfying and everything Thanksgiving all the way. This isn’t an overly sweet pie so be sure to taste the filling and adjust as you need. If you’re worried about tasting the batter with egg in it, wait until the very end to add them. Add all other ingredients, taste and adjust sweetness then add eggs last. Super Easy and Super Fool Proof! Everyone will love it! 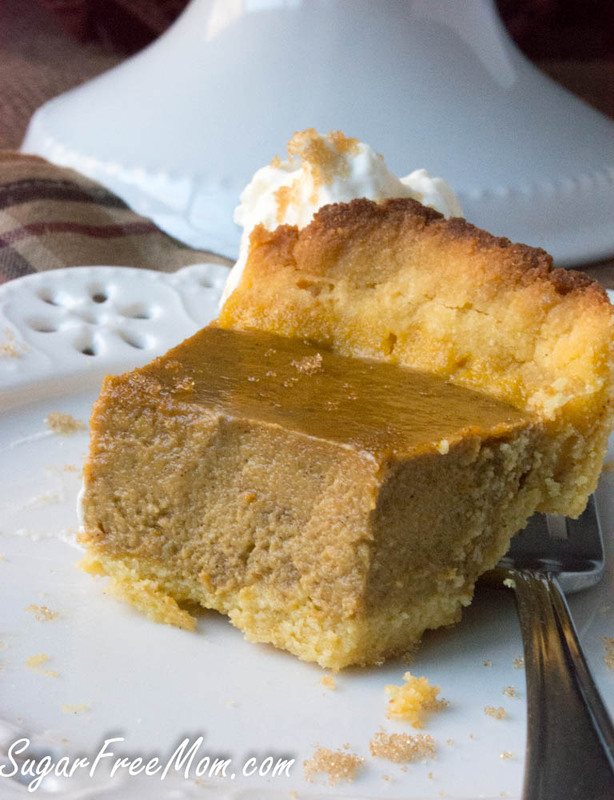 If you want to make this without the crust, my recipe for Pumpkin Pie Custard is the filling I used here. See that recipe for the nutrition info minus the pie crust. If you don’t have Sukrin fiber syrup, any liquid sugar free sweetener will work to replace it. If you don’t have pumpkin pie stevia, use vanilla or plain. 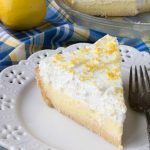 If you have neither sweetener listed to make this pie, I would suggest using 1/2 cup of a low carb sweetener you have on hand. If you don’t have maple extract, replace with vanilla extract. Natural sugars occur in dairy products and in the pumpkin filling so that is why you see 2 grams listed in the nutrition info. No sugar has been added. You can also taste the batter of the filling before adding the eggs to determine if you need it sweeter for your tastes. This is not an overly sweet pumpkin pie. 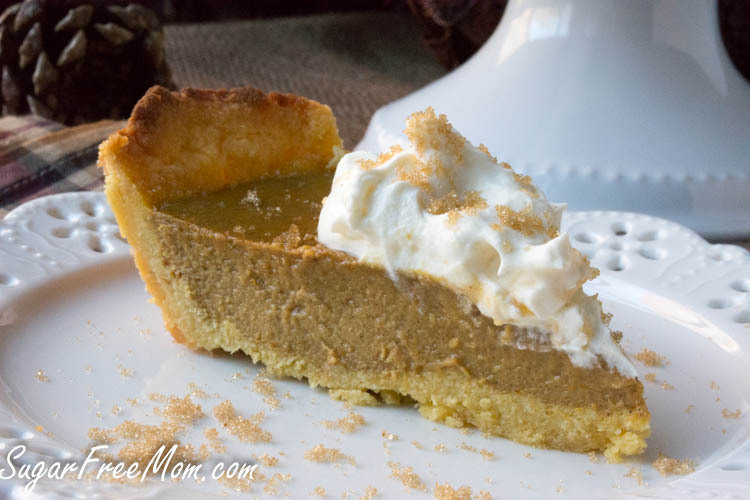 I used my Coconut Flour Press In Pie Crust for this recipe! If you’re not needing gluten free, I also have this recipe with a whole wheat crust here. You could also make this dairy free by subbing the cream or milk with almond milk. Prepare your pie crust and let cool while you make the filling. Mix all ingredients together in a large bowl and stir until well combined. Pour filling into pie crust. Place pie onto a baking sheet for easy removal from oven. Cover crust edges before baking or they will burn. Bake 40-50 minutes or until set. Cool 30 minutes then refrigerate. Add some sugar-free whipped cream and enjoy! 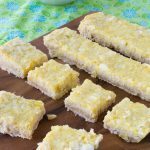 If you make this crustless there are 2 net carbs per serving. The nutrition information is including the crust. Net Carbs per serving 4g. 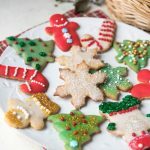 This recipe was first published in November 2016 and updated with video in 2018. 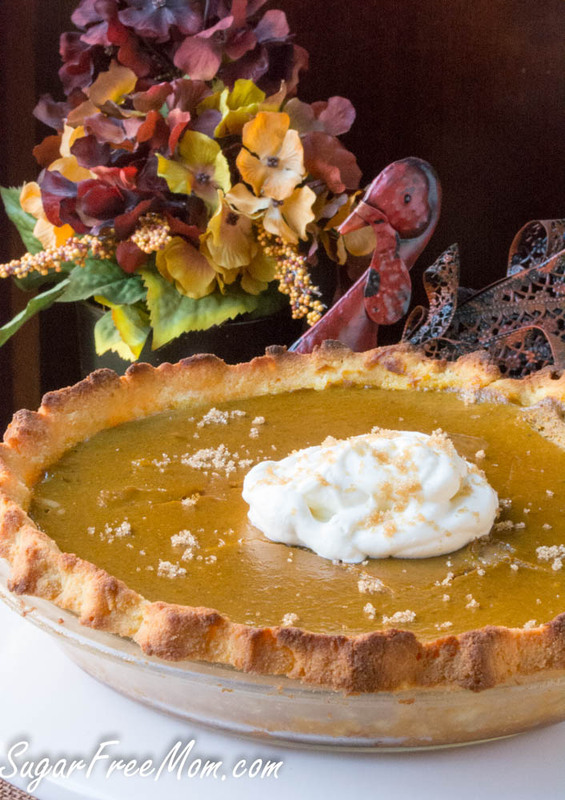 I’m always looking for a good sugar-free pumpkin pie recipe– can’t wait to try this one! I Didn’t have sukrin syrup on hand so I used raw coconut nectar (a liquid sweetener as recommended) but otherwise followed the recipe to a T. However at 50 mins, the pie filling is still extremely watery. Please help! I have an electric stove and oven, is yours gas? May just need 10 more minutes, hope you covered the crust edges though. It might be a bit jiggly in the center but once cooled and refrigerated it should set fine. Thank you! I don’t have Sukrin syrup, either, and was a bit stressed wondering how to compensate. 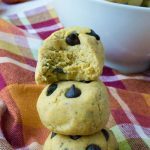 How is using the stevia powder different from using the drops and how do you know which one to use when baking? 30 carbs in 2 TB of the Sukrin syrup. Way too much. Thanks. I made this for Christmas dessert and it was SOOOOOOOO good, no one believed me when I told them it was low carb. I was intrigued by your recipe and thought it looked good for someone who is gluten free, until I looked up Sukrin syrup. It’s made with barley malt, so very unlikely to be gluten free. Can you replace it with honey or maple syrup? And maybe not need the stevia then. Well sure then it’s not low carb or sugar free but yes you could use either, just would need to add maybe a 1/2 cup to pumpkin mixture before eggs are added so you can taste it and decide if you need more sweetness. 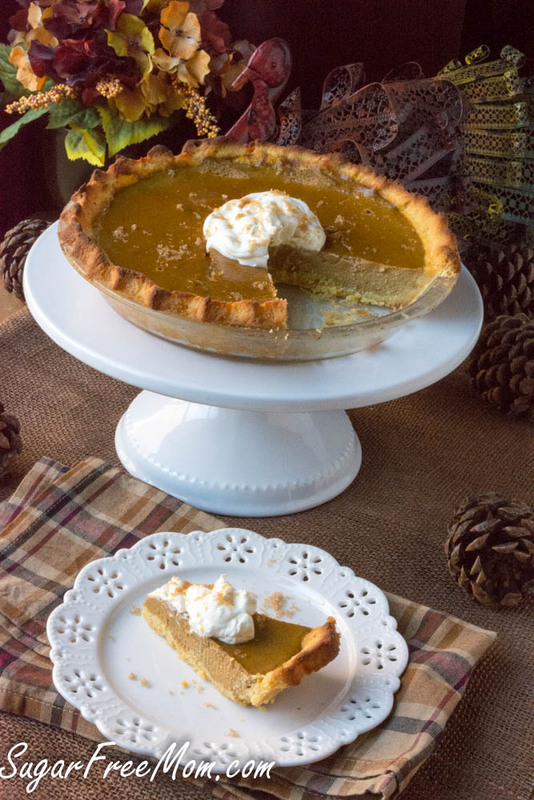 I’d like to try this for Thanksgiving but no time to buy Sukrin syrup – would Yacon syrup work…? Answering my own question… Yes! 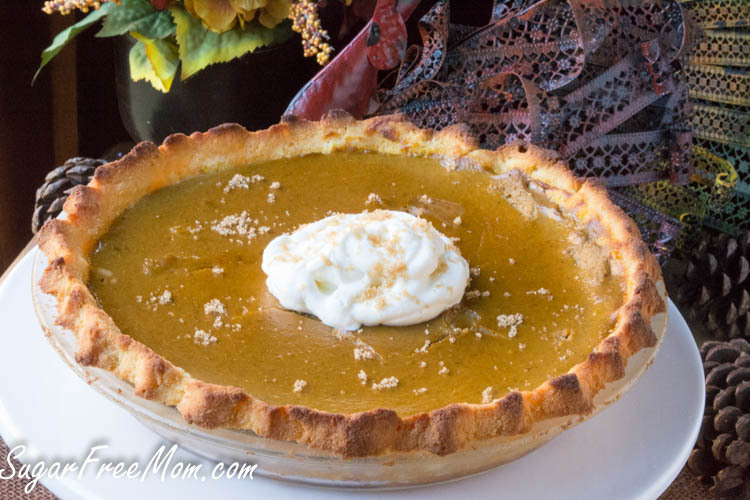 Yacon syrup works ..gives a nice flavour..
Can I make ahead your low carb coconut flour pie crust and the low carb sugar free pumpkin pie and then freeze it until Thanksgiving? Hello Thankyou for the recipe. I have tried 3 different Keto reciepes and still lacks the flavor of a real pumpkin pie. Is it the lack of evaporated milk or condensed milk? It just does not have the same flavor. Sugar-free, huh? That’s interesting. I’m curious to taste that pie! You say in your tips “If you don’t have Sukrin fiber syrup, any liquid sugar free sweetener will work to replace it.” but I do not see in the recipe what that is for, because you say “1/3 cup Swerve brown sugar sweetener or Sukrin” and isn’t that a powder or granular thing, not a liquid? I just want to make this for the first time on Thanksgiving and have it not be either too much liquid or not enough. Thanks so much! That was a mistake, I removed the comment. I think I just meant if you don’t have Sukrin brown sugar sub any other will work. 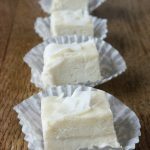 Oh my goodness – often times you try a recipe that has been ‘doctored’ for keto and the results range from uh – to pretty good. Well, this one rates a 10 – an absolute 10. Loved it, loved it, loved it. Ah, the taste of pumpkin pie again. I didn’t have the sweetener that you suggested but used powdered erythritol for the whipped cream and Truvia in the filling. It was MARVELOUS!!!! Thanks so much, Thanksgiving just got much better AND gave me yet another reason to give thanks. That’s a wonderful comment thank you! Great pie Brenda. I was surprised at the flavor. Look out Sara Lee! I have an issue with the center not setting up all the way. I used a separate thermometer to get my oven to 350. I baked for 70 minutes. I will try 90 minutes nextime. The pie looks like it could handle the extra time. I may also try 1/4 cup heavy cream (By mistake, I left out the cream on the first try. It set up okay and tasted fine). This is by far the best crust I have ever tried: even with store-bought! Thank you for sharing your recipe, making it this morning for Thanksgiving! It looks yum! Instead of stevia can in add organic jaggery. FANTASTIC!!! I make a sweetener with erithritol, xylitol and stevia. Made my own brown sugar using about 1/4 t in the granulated sweetener. Used 1/2 t liquid stevia and 1/2 t vanilla extract. Since Thanksgiving when I made a pecan pie, I use a pecan pie crust. Wow! I thought this tasted like “regular” pumpkin pie. THANK YOU! Hubby made sf whipped cream for it. So decadent! Can you tell me something, I’m confident that i followed the crust recipe perfectly, but after 10 minutes in the oven, the edges were perfectly Brown but the center was swimming in butter. It was so saturated in butter, it’s like i used too much butter, but i followed the recipe, will my crust not come out flaky or crispy so long as it’s swimming in butter? 60 lbs since April 2018, today it’s January 12th, 2019, 6″ smaller waist, 3 sizes smaller shirts.